My first bird of the Florida trip? A boat tailed grackle at the Punta Gorda airport. The second? One that would capture my interest for quite some time, the Fish Hawk or Osprey, Pandion haliaetus. Parking at the condo, sick as a dog, I walked around to the back to a small concrete dock overlooking a tidal canal built for pleasure boats. Down the canal on the far side was perched an osprey, ripping into its meal, a black and white fish called a sheepshead, or Archosargus probatocephalus. 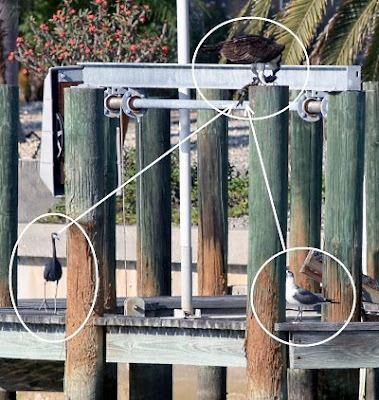 The osprey drew the attention of a little blue heron and ring-billed gull. Wow, what a cool bird I thought to myself, I wonder if we'll see any more? Sure enough, only an hour later, we made our way to the beach. 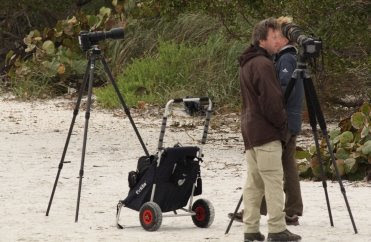 I put the long lens on the camera before heading out, hoping to get some shore bird images. I wasn't disappointed. And from the east came a fantastic osprey clinging to another sheepshead with its huge talons. The next morning I went on my photo scouting mission of the island, even though I was sick as ever with a fever hovering around 101. I pulled into the island lighthouse parking area, and this nest platform towered above everything except the lighthouse. 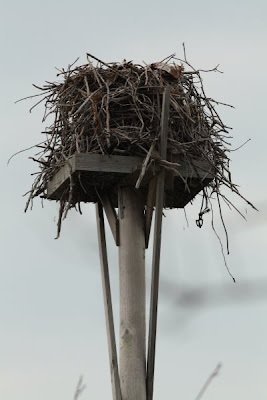 An osprey nest, quite a piece of construction. And as I walked out on the fishing pier near the parking lot, I noticed these pro photographers with their Nikons pointed at the nest. 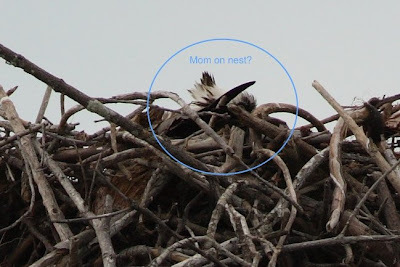 I didn't have time to stick around and wait for the osprey, but after looking at the shot above more closely, I'm sure they were waiting for good shots of a male returning to the nest with a big fat fish, possibly feeding it to juveniles below the mom. In the field, I couldn't see the sitting mother, only when I got back and examined the photo more closely did she pop out at me. Yes, the picture below is the same exact photo as the one above, just cropped to ~%100. The clarity of the crop really demonstrates just how sharp Canon's 400 5.6L lens really is. This bird paused for a moment, after adjusting its wings, and all of the sudden, WHAM! What a great set of photos, and what a great experience. Some "Wow!!!" photos there, Tom. Great work. 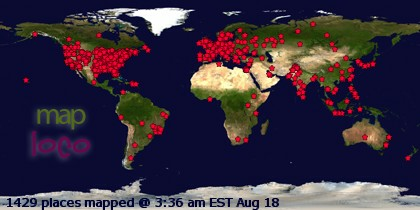 Terrific and Humbling. An absolutely terrific series of shots, and humbling to realize what a lousy fisherman I am by contrast! What a scary bird if you are a fish! Cool to watch though! Wow, great action shots, very nice. Super bird photos and post!!! You go, Tom!!! I cannot WAIT to buy a better camera. You are having so much fun capturing the action!!! 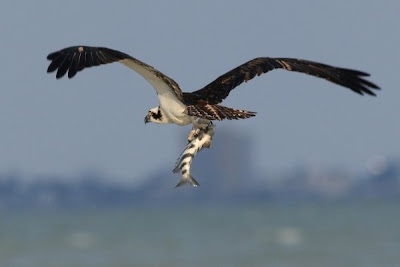 Wow, those are some amazing Osprey photos! I think I need to take a trip down south! That is a wonderful bird! Wren- Thanks, Sanibel is an absolute nature paradise. It isn't bad for the humans either. Thank you Dave! Yes, I sure have never dove into the water after a fish. Bob, thanks much appreciated. Someday I want to look through your telescope. That thing is massive. JJ- Yes, getting a digital SLR really opens up your photography options. I took these shots with a lens I rented for two weeks, and it was well worth the money. Thanks Tom- Sanbiel was awesome. If Skybus Airlines ever comes to the Niagra airport, you could make the flight for extremely cheap. Unfortunately, they abandoned their plans to start flying from C-bus to Niagra Falls. Beth Ellen- Thank You. I can say that I never appreciated this species enough until I went to Sanibel and observed them up close. They are really fantastic. I must say though, any time I get a chance to observe a new creature for a while, I usually think that it is fantastic! WOW! Fantastic action shots, Tom!! I love watching ospreys when they dive for fish. Amazing creatures. Amazing! Sorry you were so ill, though. That must have been some experience. The photos are great! Tom: We have Osprey at Lake Hodgson and I enjoy as they fly around looking for fish. This is a great set of pictures. Female Cardinal Trying to Get Into Our Bedroom!